Fashion Architect: Oh, the controversy! 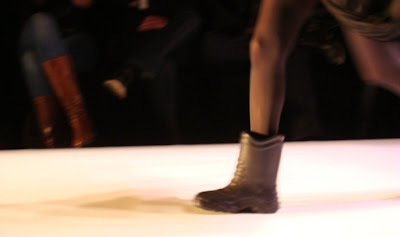 I'm getting the feeling that day two of Fashion Week Athens is going to be the weirdest ever. I really don't have time to blog about all the shows right now, as I have to run and get ready in order to get there again in time for day three, but I HAVE TO blog about this one thing. 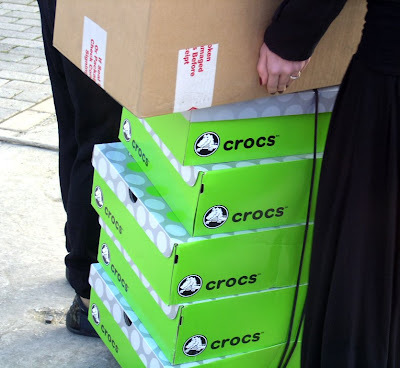 Two stylists carrying boxes of Crocs backstage? I could only suppose that they were just boxes, containing no offending footwear. And then, the Konstantinos show started. And it was definitely an OMG moment. hahaha... *funny post*....I still DETESTE crocs, any type of them! funny post indeed! enjoy the final day, hopefully see you there! Really great work. Nice Style and very good creation! Happy Day! αν ήταν χορηγεία καλώς. αν ήταν άποψη ewwww. hahaha!! thank god i was sitting back and i couldn't see down the legs!!!!!!!!!! apaisia papoutsia!!! noooooooooooo, crocs are taking over the woooorld! ahah I wear croc's to the hospital! Raquel, I think the hospital is the only place where it's acceptable - if not required - to wear crocs. I also forgive those who wear them to the beach. But that's about it. Damn, and tourist season begins shortly here in Greece. The horrors I'm going to see! telika x8es dn systithikame kanonika! :( milisa ligo me tin chloe alla meta edines tis proskliseis kai egw eprepe na fygw!